CIT's Cozy Wittman was a featured guest on the "Financial Symmetry" podcast hosted by Mike Eklund and Chad Smith. 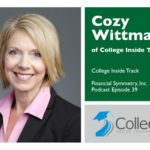 Cozy shares how so much has changed over the past 30 years, between college prices skyrocketing up to 500 percent, and the vast amount of options now available. She emphasizes that the game has changed and parents need to change their strategy in order to come out of this without massive debt. Cozy shoots down many misconceptions about the FAFSA and testing processes that people have. She points out how these misconceptions and mistakes are costing families thousands in potential awards and making them miss money saving options. She also shares some really helpful insight on how to use 529 plans to your advantage as well as when and how to start planning for college. The importance of an early start and a well-researched list of schools to apply to are a few of the points she stresses the most. Click here to listen to the podcast and Cozy's 7 tips.